Biography: In 1967 he graduated from the Karaganda Polytechnic Institute with a degree in mining electrical engineering. 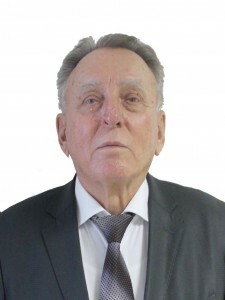 In February 1974 he defended the thesis of a candidate of technical sciences, in March 1978 he was awarded the academic title of a senior researcher, since 2005 – the academic title of professor. He began his career in March 1953 as a miner at the 101 Karagandaugol combine. From October 1953 to July 1956, he served in the Soviet Army, from June 1957 to December 1958 – electrician of mine 101. From December 1958 to February 1963, he worked as an auto-electrician of the Saransk Automobile Base No. 1 of the Karaganda Oblavtotrest. From February 1963 to February 1991. worked at the Institute Giprouglegormash in the positions of the researcher, head of the laboratory, head. department and deputy. Director for Research (from March 1986 to February 1991). From March 1991 to September 1991 – Chief Engineer of Karaganda Promstroi enterprises under construction. From September 1991 to the present, Professor of the Department of PT. During his career, he was the head of work on the creation of mining and transport equipment: plate curved conveyors P65 and P80, mine pushers of trolleys, tippers, mine passenger cars, etc. Awarded the Order “Badge of Honor”, medals “For Valiant Labor”, “Veteran of Labor”, breastplates “Miner’s Glory of III degree”, a bronze medal of the USSR Exhibition of Economic Achievements, signs “Winner of the competitions”, Certificate of Merit of the Minister of Higher Education and Science of the Republic of Kazakhstan, thanks letters, etc. Author of over 110 scientific papers, incl. more than 20 copyright certificates and one patent, 3 textbooks and 6 textbooks in three disciplines. More than 30 educational and methodological developments have been introduced into the educational process, including two electronic textbooks, slide lectures, etc. Scientific works: 4 Dedov A.N.